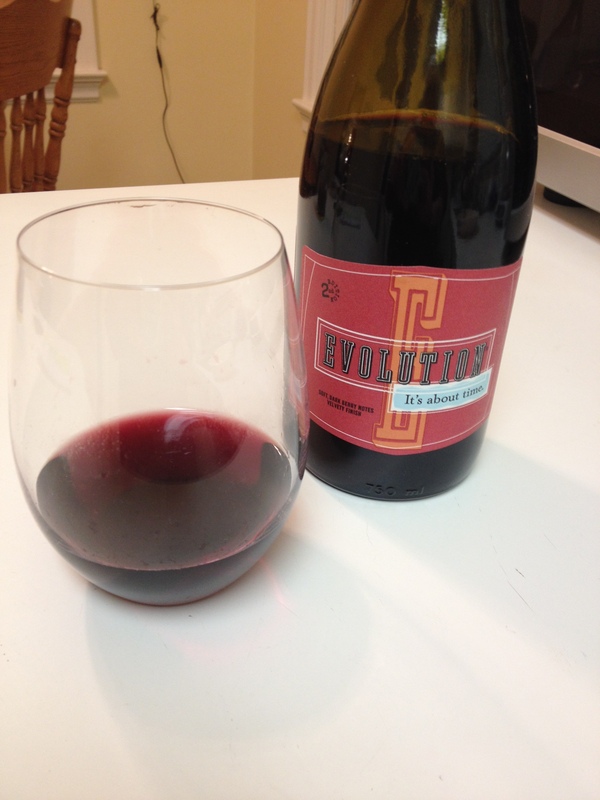 And the lesson is….drink more wine! 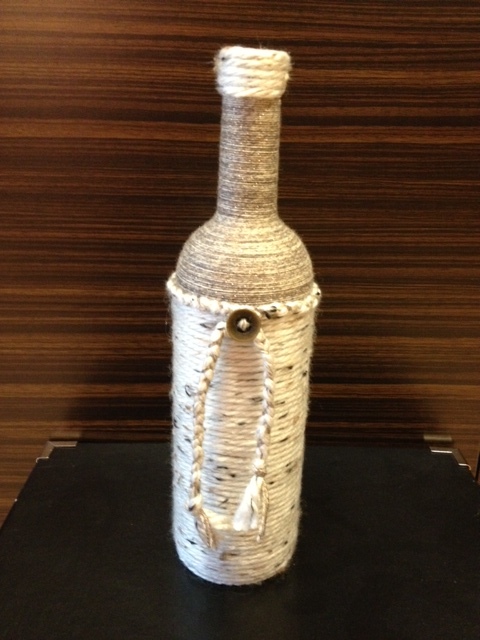 While wine tasting in the Dundee area, my friend Dana and I noticed these candles made from cut wine bottles. 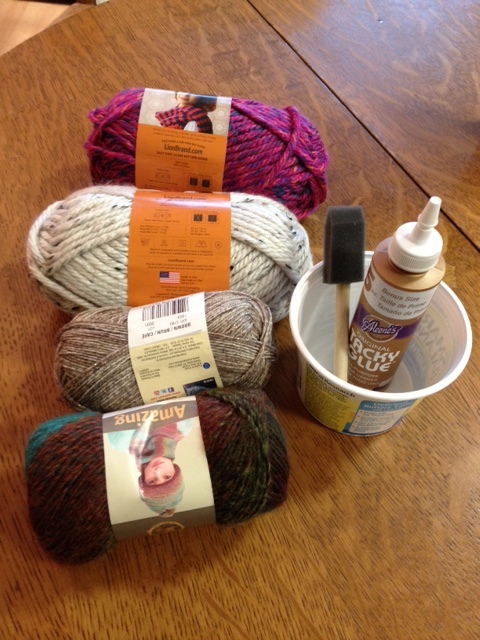 I figured there must be an easy DIY approach to the project, so I set out to peruse Pinterest. 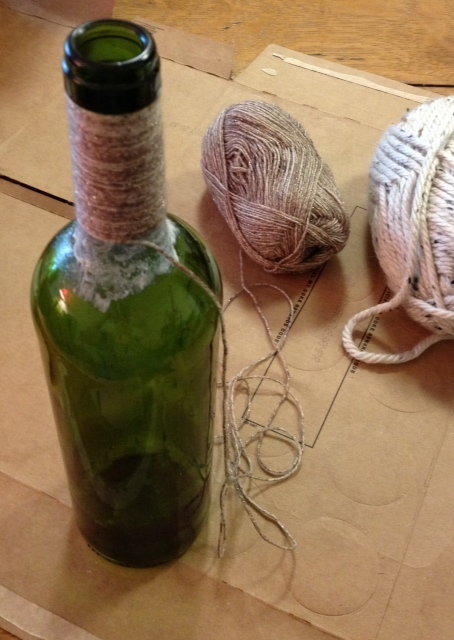 I pinned a link for DIY bottle cutting that used simple things from home – yarn, nail polish remover, and a candle. 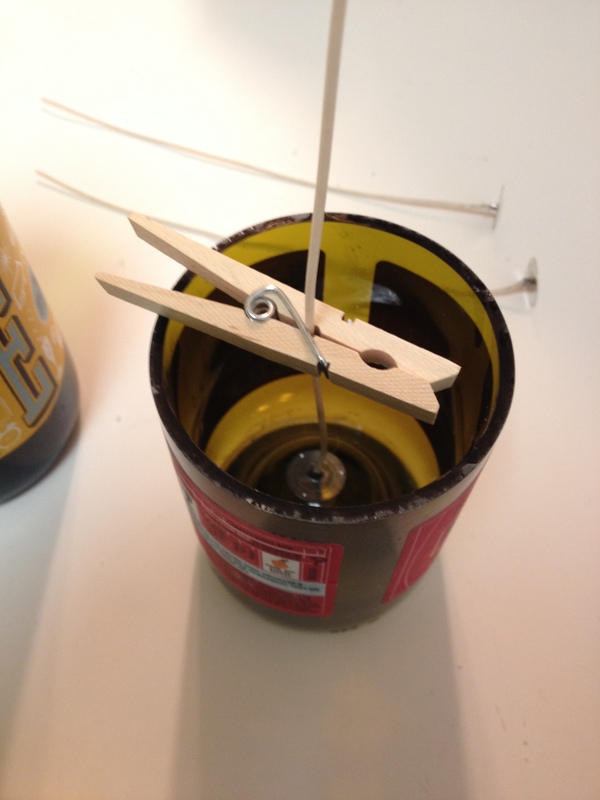 After many, many, many unsuccessful tries using this method, we gave up and took to the internet to find a solution. 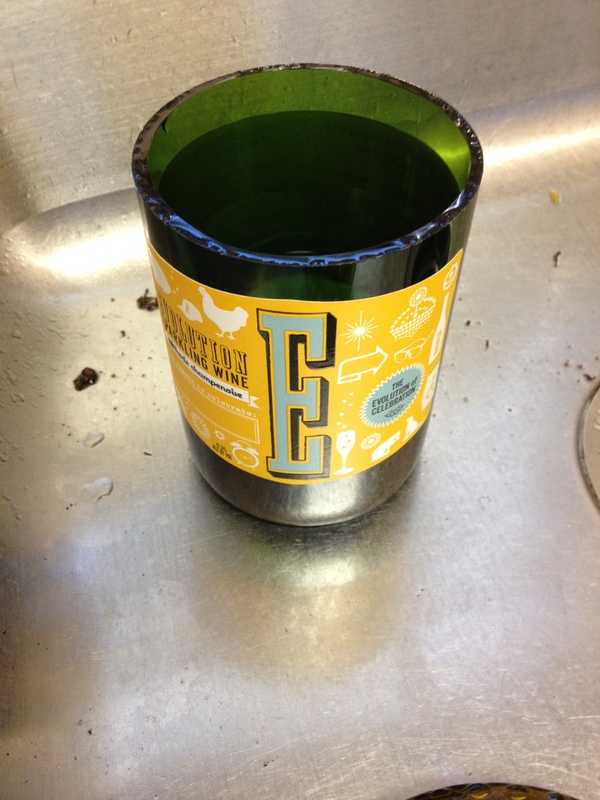 That solution was the Generation Green Bottle cutter. 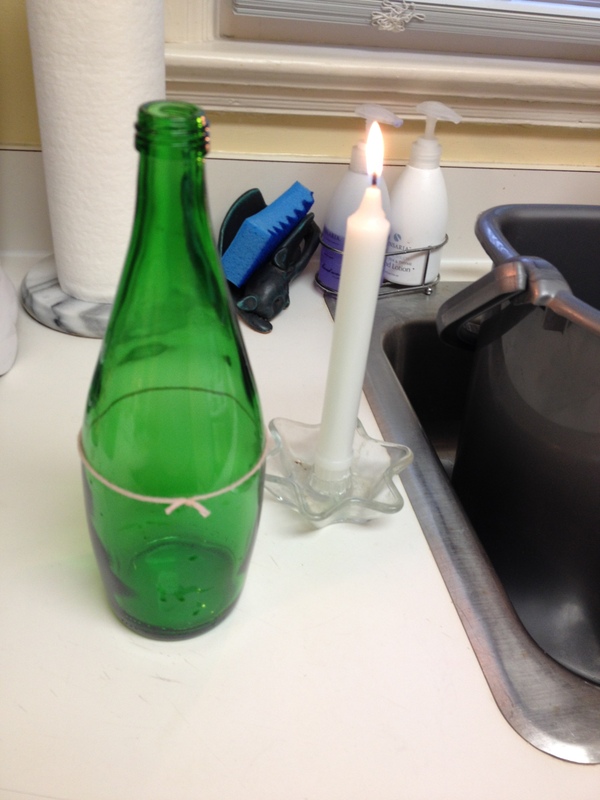 With a few clicks on Amazon, we ordered the bottle cutter and set out on a different path. After reading the reviews, we knew that there would be some failures and it would take some practice, but we moved forward optimistically. 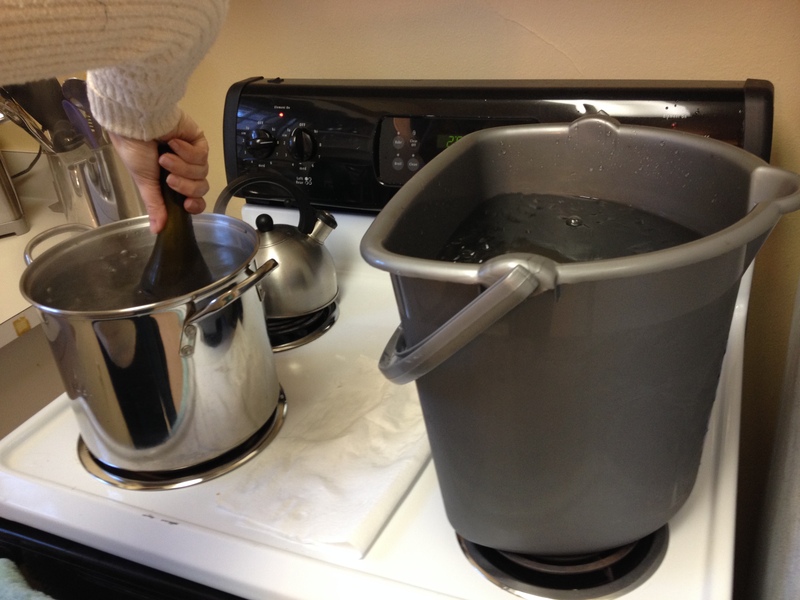 The process starts with scoring the bottle and then alternately dunking it into boiling water and ice water until the bottle breaks along the score. 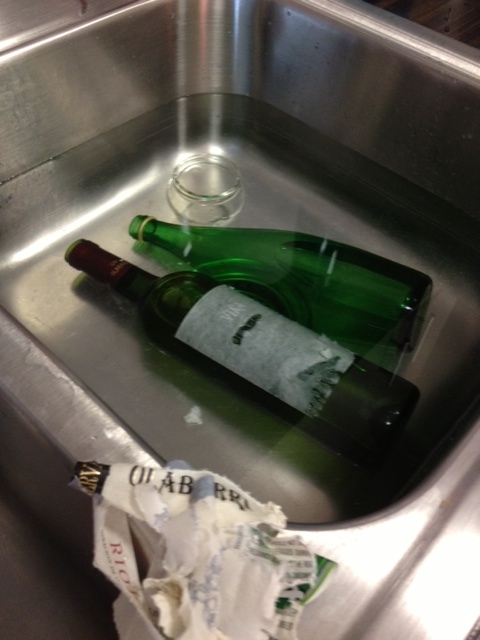 We triumphantly cut the first test bottle and set forth with the actual wine bottles. We had success with 3 wine bottles and then it was downhill from there. 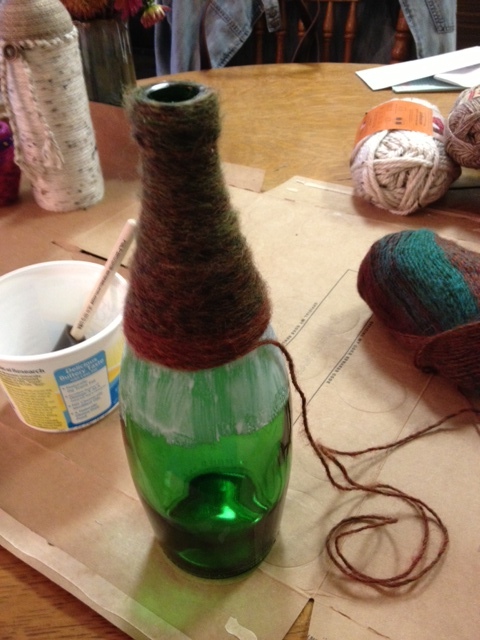 We suspect that the thickness of the bottles may have had an effect on the success rate. 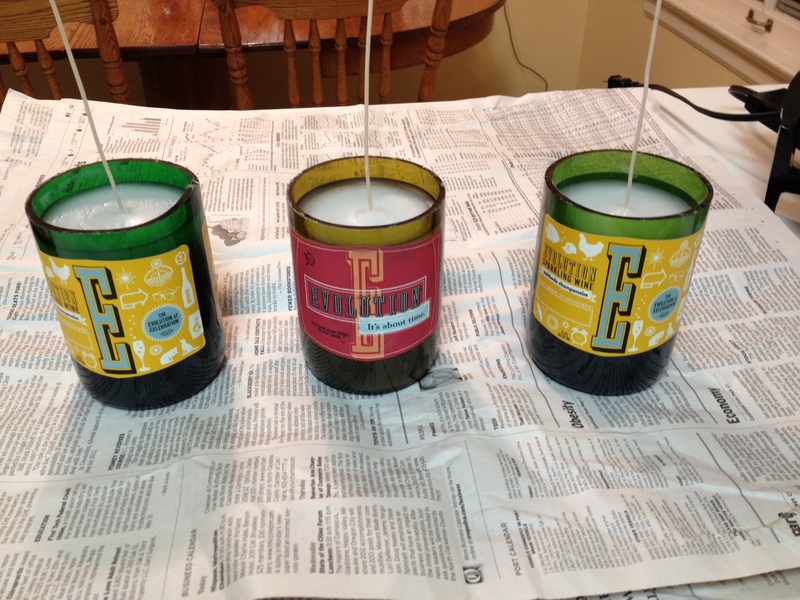 After 9 subsequent failures, we decided to move on to candle making. We bought a block of wax because it was a good value. 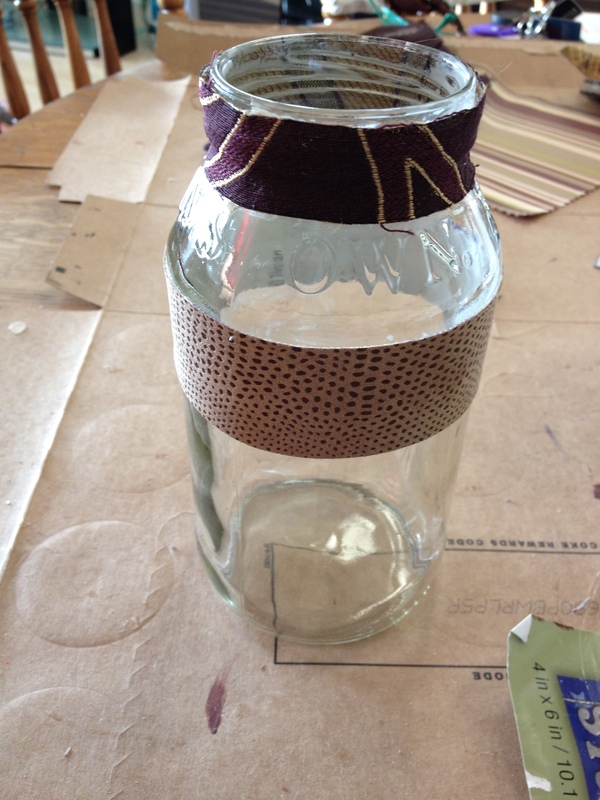 However this created a lot of work for us because we had to break it up into smaller pieces. 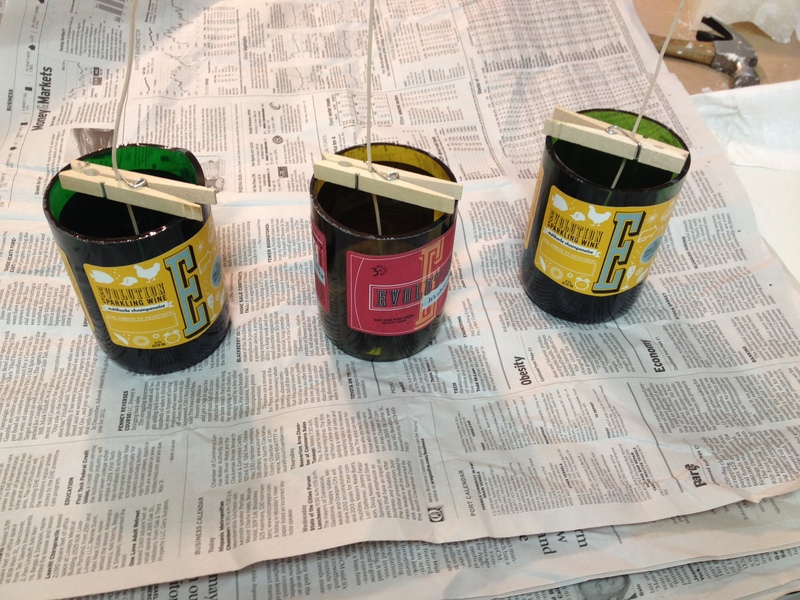 Using a hammer, we took turns smacking the block of wax until we had small enough pieces to melt. 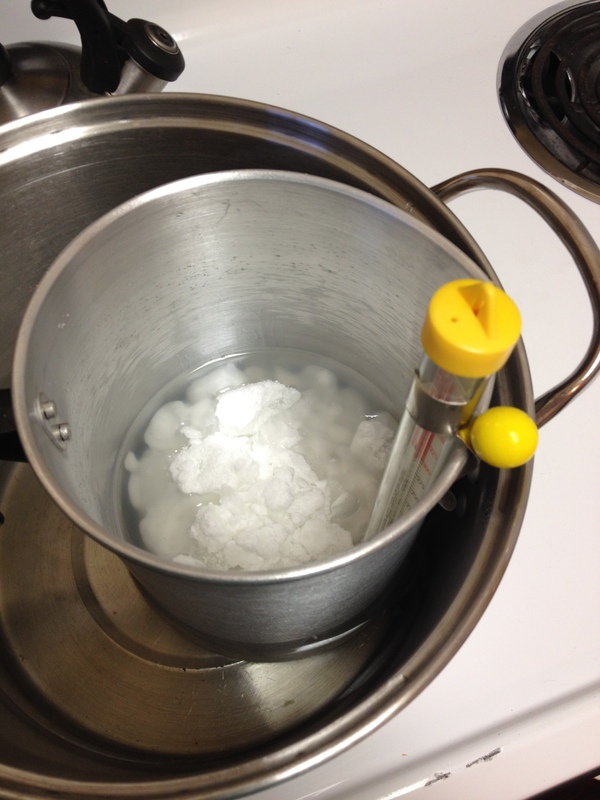 Once the hard work was complete, the act of melting wax, adding scent, and pouring was a snap. 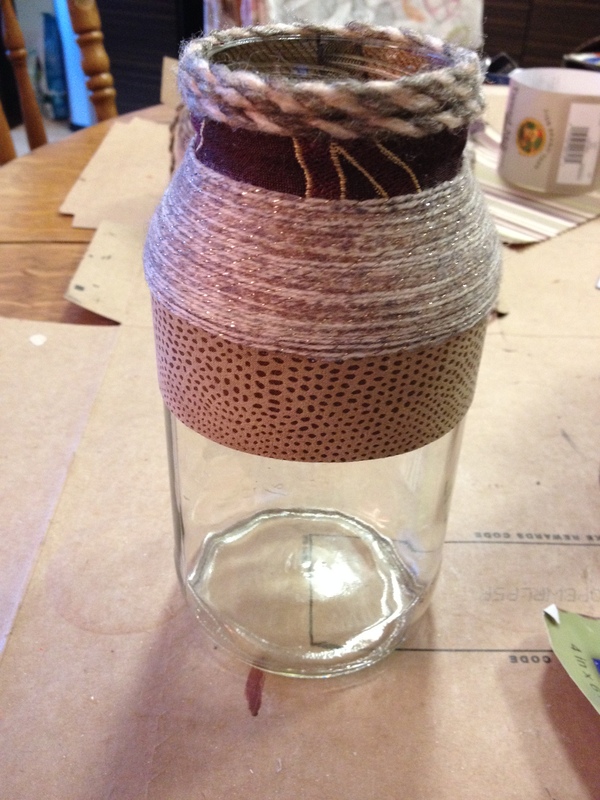 Lessons learned – 1. use jars that are already the size you want (you can always decorate them) 2. 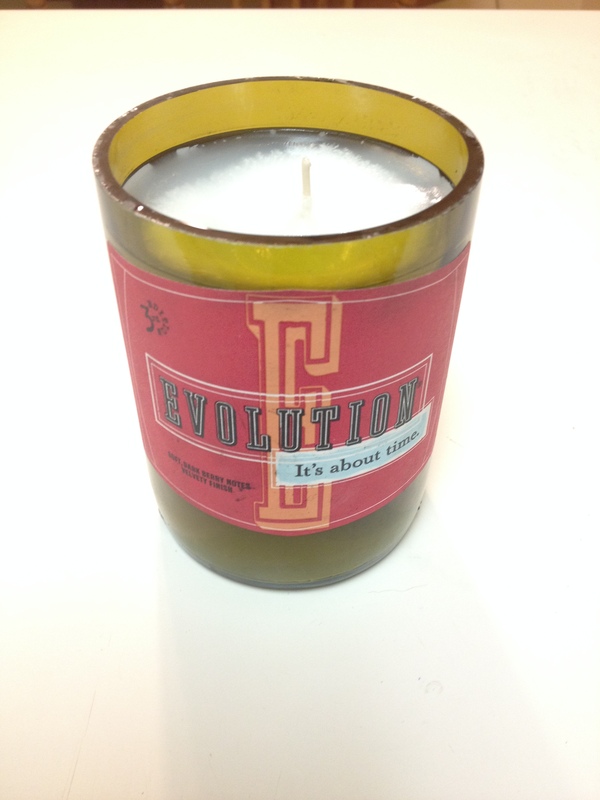 Purchase wax that is already chipped into smaller pieces 3. 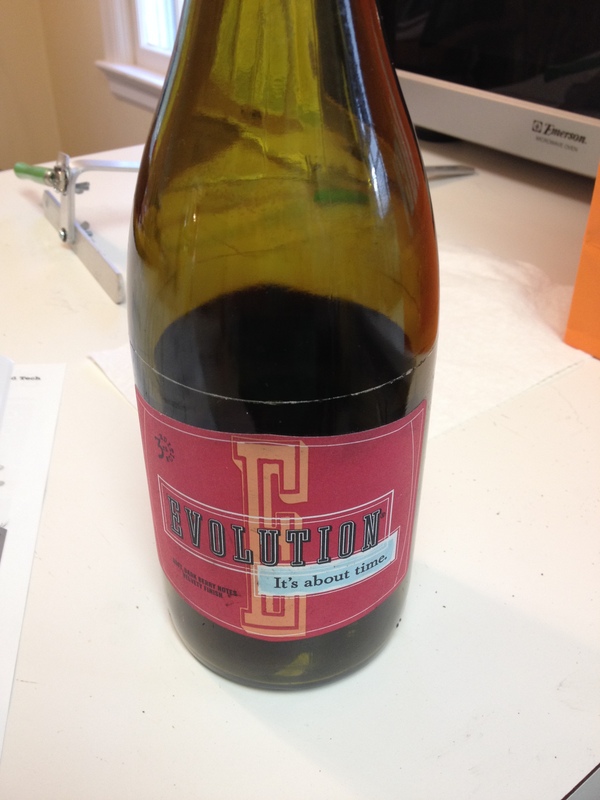 And finally, DRINK MORE WINE! 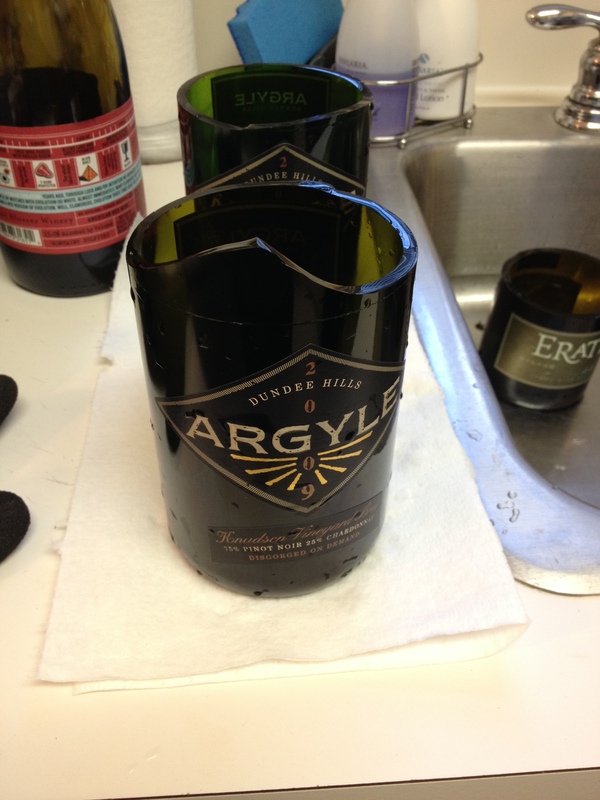 If you are going to cut your own bottles, you will need a lot of them with a failure rate of 75%! So drink more wine! Cheers! 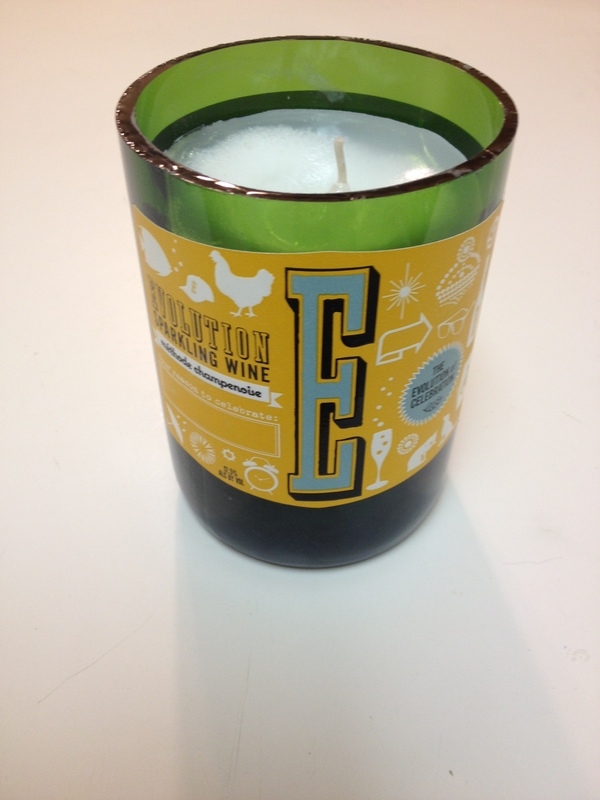 Posted in Project Pin and tagged candle making, candles, crafty, glass bottles, glass cutting, Project Pin. Bookmark the permalink. 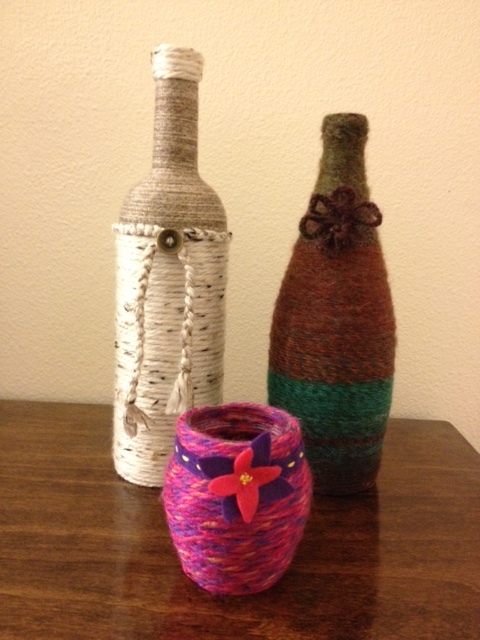 I really enjoyed creating the different looks and combinations for the original yarn bottle projects. 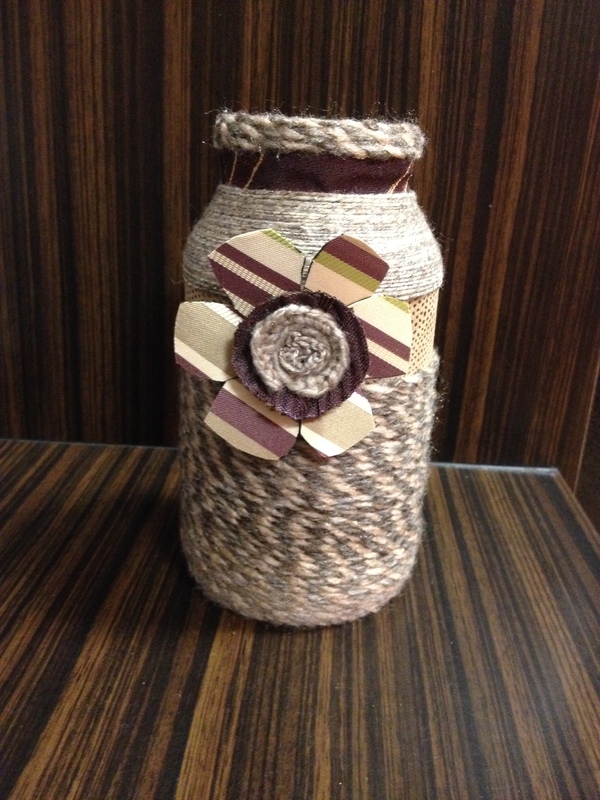 There are limitless possibilities that one can achieve by using different yarns and embellishments. 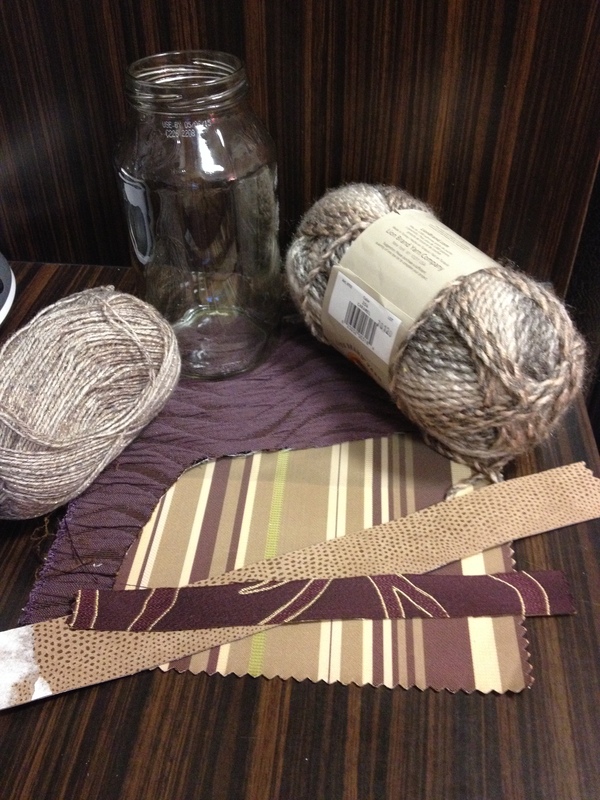 I was inspired to see if I could use a combination of yarn and some of the decorator fabric samples I got at SCRAP. 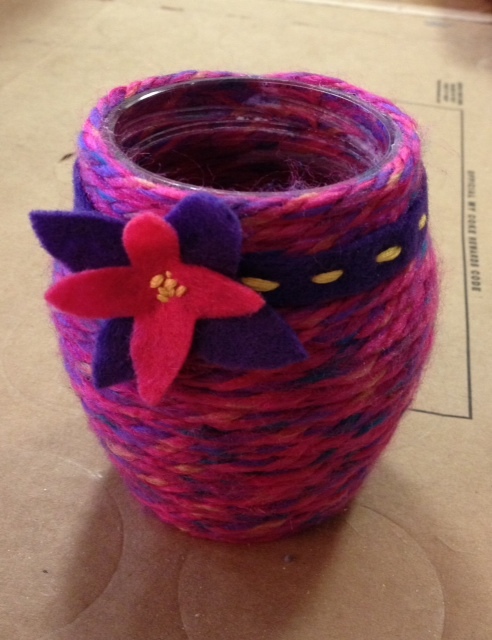 I started with a spaghetti sauce jar and used 2 different yarns with 4 different fabrics. 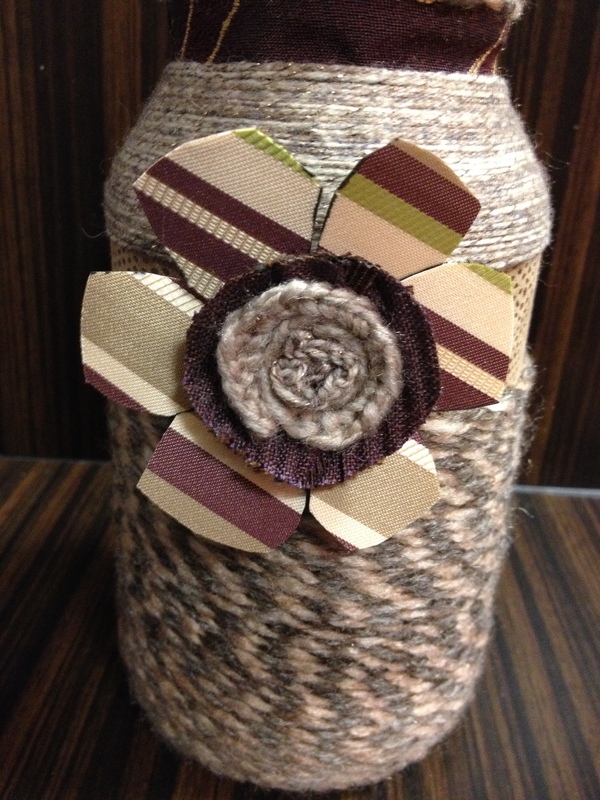 I am really happy with the way the flower embellishment pulls it all together in the end. 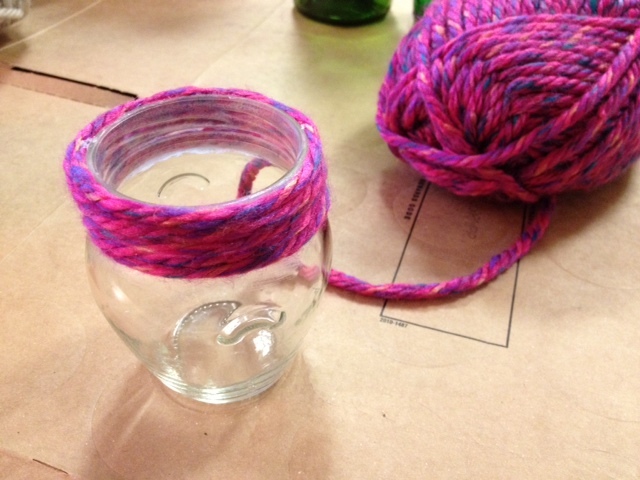 Posted in Craft Your World, Project Pin and tagged crafty, glass bottles, reuse, SCRAP, textiles, yarn. Bookmark the permalink. 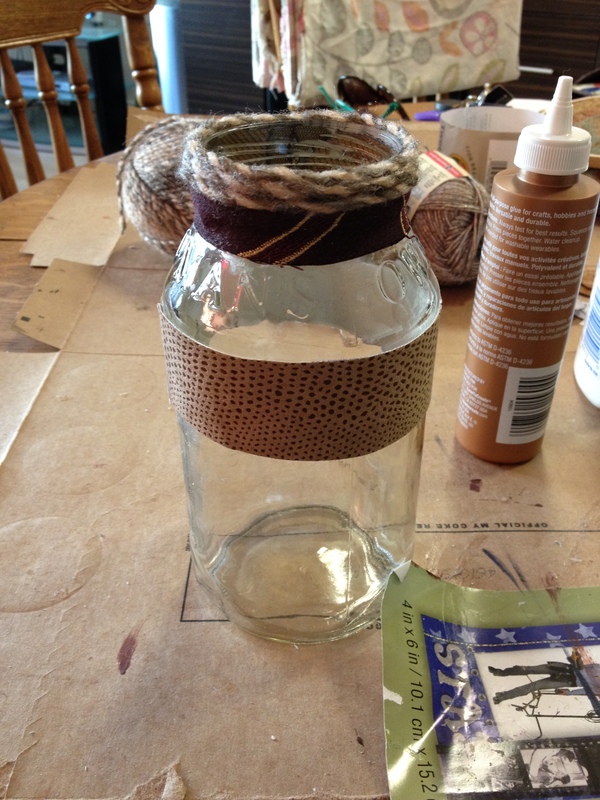 Another Pinterest-inspired project under my belt. 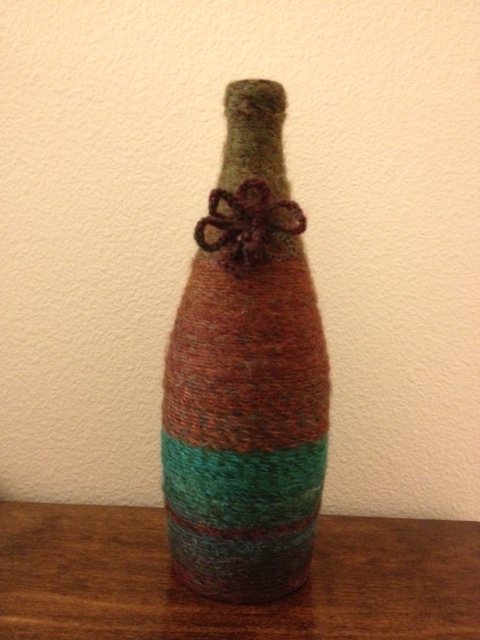 I saw these yarn covered bottles and thought they were beautiful. So I thought to myself, “I can make those!”. 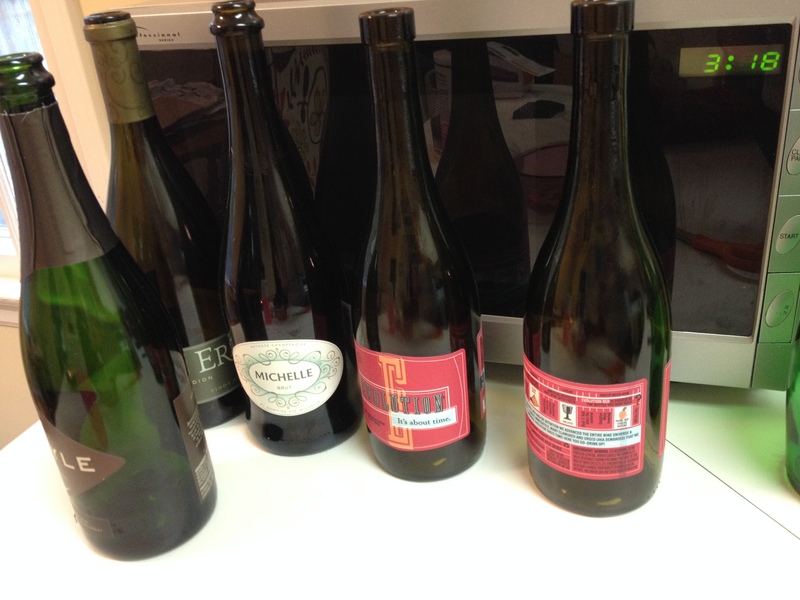 I picked 3 different glass bottles – a Perrier bottle, a wine bottle, and a glass jam jar. 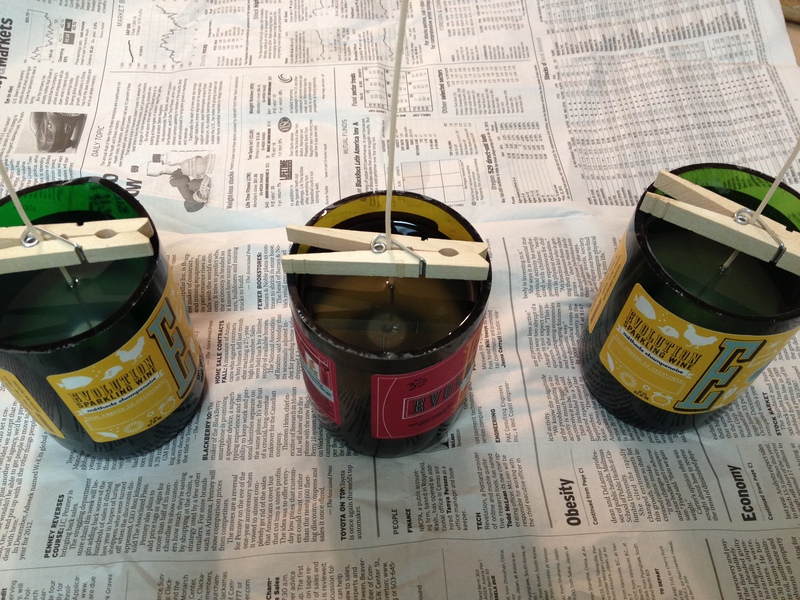 I used Tacky Glue and a foam applicator to spread the glue on each bottle. 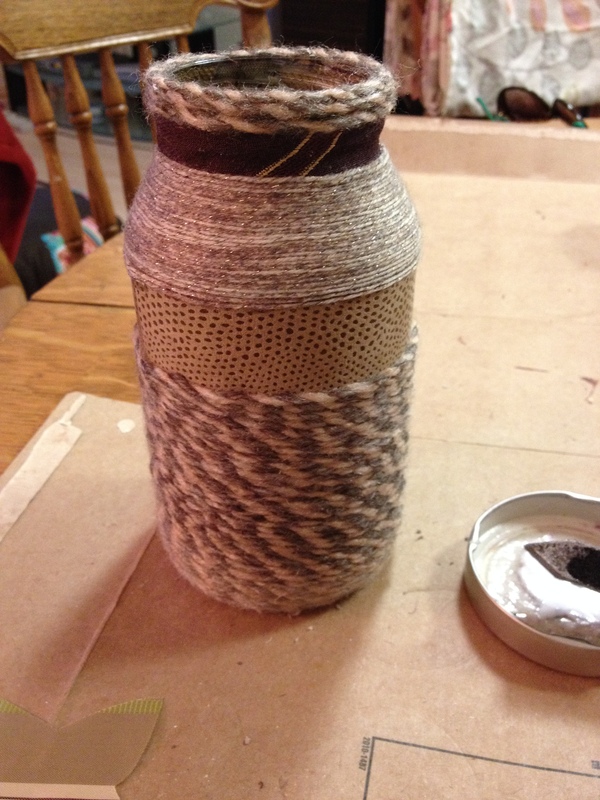 Then you wind the yarn, being careful to hide your start and stop. The possibilities are endless. 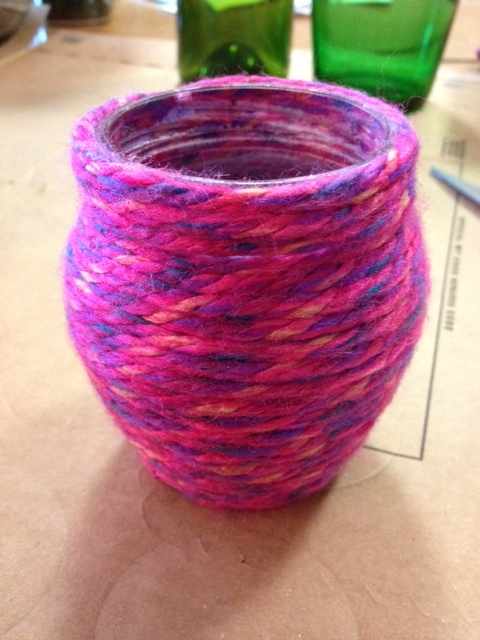 **Note to self – next time choose fatter yarn! 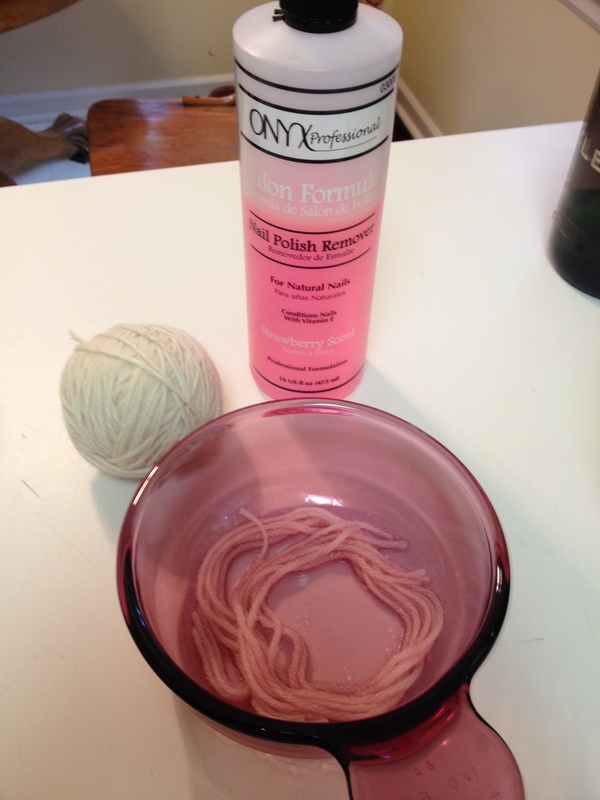 The smaller the yarn, the longer it takes. But I think the results are worth it. 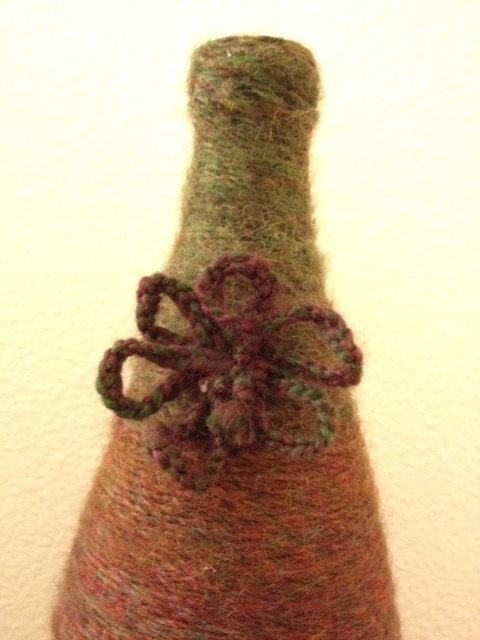 Posted in Project Pin and tagged crafty, glass bottles, Pinterest, yarn. Bookmark the permalink.